The Catholic Church emphasizes that it’s imperative to consider the four Gospels as actually forming one whole unit. The four Gospels aren’t four separate Gospels but four versions of one Gospel. That’s why each one is called The Gospel According to Matthew or The Gospel According to Mark, for example, and not Matthew’s Gospel or Mark’s Gospel. No one single account gives the entire picture, but like facets on a diamond, all sides form to make one beautiful reality. The faithful need all four versions to appreciate the full depth and impact of Jesus. Catholicism cherishes each different perspective but stresses that all four together, in conjunction with the other inspired writings of the New and Old Testaments, give a better portrait of Jesus. Both the Holy Spirit and the author, inspired by the Holy Spirit, intended to use or not use the same words and to present or not present the same ideas and images based on the particular author’s distinct audience. 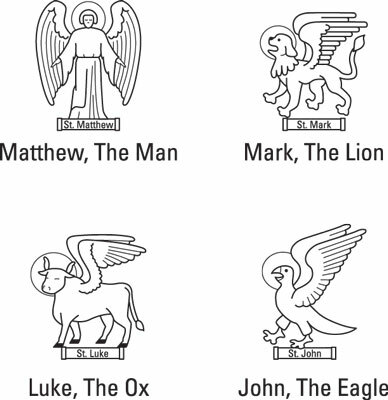 The figure shows how Matthew, Mark, Luke, and John are often depicted in art from Revelation (Apocalypse) 4:7. According to St. Ambrose (339–397), a Father of the Church (learned scholar), a man with wings symbolizes Matthew because he begins his Gospel account with the human origins and birth of Christ. Mark starts his account with the regal power of Christ, the reign of God, and is therefore symbolized by a lion with wings, which was held in high esteem by the Romans. Luke begins his account with the father of John the Baptist, Zachary, the priest, and is symbolized by an ox with wings because the priests of the temple often sacrificed oxen on the altar. John is shown as an eagle because he soars to heaven in his introduction to the Gospel with the preexistence of Christ as the Word (logos in Greek). The writers of the four Gospels are often depicted like this from Revelation (Apocalypse) 4:7.